In The Jolly Gang's Spooky Adventure, we meet Moxxie, a twentysomething city girl with a bare midriff and a limitless supply of wisecracks. She also has a job as a reporter for a supermarket tabloid that specializes in spooky encounters, so it's no surprise when her editor sends her to investigate a ghostly appearance in a psychic's apartment. 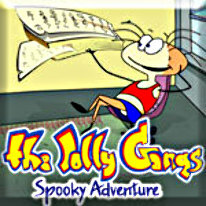 Solve hidden object puzzles, beat mini-games and chat with Moxxie's dense but good-natured pals as you work your way from one vibrantly animated scene to the next in The Jolly Gang's Spooky Adventure!